Keep your phone (and your GPS directions) in sight with these mounts. If you’re using your smartphone for GPS directions but leaving it in your lap or cupholder, it’s time to get a phone holder for your car. These mounts allow you to position a smartphone within line of sight—and keep it out of your hands, thus avoiding a ticket in some states. The best phone holder isn’t the same for everyone, however. Car manufacturers not only use different types of vents, but they mix up the positions of both CD players and vents too. States also have different laws for what can be attached to a windshield (and where). Accordingly, our list of the best phone mounts doesn’t single out just one or two picks. Instead, we’re sharing the most convenient and reliable models as a group after putting them to the test in a variety of cars. Note: For this first round of evaluations, we’ve focused on vent and CD slot mounts, as windshield mounts are illegal in many states. Tested on a car with vertical vents. The BE Universal Smartphone Car Air Vent Mount is the rare phone holder that works well with vertical-slat vents. It locks onto your car with a small clip that is tightened by first turning and then pressing down--and it hangs on very tightly. In over nine months of use, I haven't had to readjust it once. It also grips to phones firmly, no matter how you rotate the 360-degree ball joint. Supported sizes are phones ranging between 1.9 to 3.7 inches in width, which covers all current iPhones and most Android models. Overall construction is solid as well. BE Universal uses a rigid, dense plastic, lined with soft foam pads that cushion and protect your phone from scratches. Tested in a car with horizontal vents. iOttie’s Easy One Touch 4 Air Vent Mount ($24.95 MSRP; $19.95 on Amazon) is a solid pick, both in price and functionality. 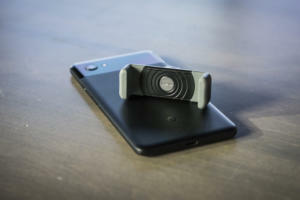 This mount has two parts, but it’s very easy to assemble: Just snap the vent clamp into the back of the phone mount, and attach it to your air vent using the spring-loaded clamp. The mount keeps your phone in place thanks to two arms that hug it tightly, using a “lock and release” system. The Easy One Touch 4 fits phones between 2.3- and 3.5-inches wide—I tested it out using an iPhone 8, iPhone 8 Plus, and iPhone X with and without cases, and it fit the bill for all three of Apple’s current models. It’ll work just fine for Android phones within that size range, too. Installation of Koomus's grip-style, CD-slot mounted phone holder is simple, with just one lever that locks the whole unit in place. This method still results in a sturdy hold, though--while Koomus includes three rubber spacers to increase the clamping force, we didn't need it. The mount itself can be positioned in a variety of ways: Its arm tilts up and down, and you can insert it with the mount pointed up or facing down. The grip-style clamp has surprisingly light tension, allowing you to mount a phone with just one hand. It accommodates larger phones, even with bulkier rugged cases. I successfully put a Nexus 6P and a Pixel 2 XL in the clamp, though the Pixel 2 XL in an Otterbox case was the most difficult of the combinations I tried. Tested on a car with horizontal vents. Car mounts that just clip onto the slats in your air-conditioning vent are incredibly convenient. They don’t block your view or muck up your dashboard with adhesive, and they work with cars lacking a CD player. And in those blazing summer months, the A/C blowing right onto the back of your phone will help keep it from overheating. Kenu makes one of the best grip-style vent clips. It’s minimalist in design but durable, with a spring-loaded side clip big enough to fit the even large phones like Plus-model iPhones and Galaxy Notes. (If you own a phone under 5-inches, you'll want to buy the smaller version of this mount.) The vent clip has grips for thick or thin vent slats, so it’ll work in most cars. And since it can rotate, you can use it with angled AC vents or turn your phone to landscape orientation. Tested in a car with round vents. You're unlikely to find a more simple, unobtrusive, and inexpensive option than this $8 phone holder. Slits on the magnetic mount’s short, rubberized stem allow it to slip onto your car’s air vent. To attach your phone to the mount, you'll need to apply one of the two included metal plates to your phone directly or slip the plate into your phone’s case. The magnet combination is rated to hold today’s largest phones, such as the Galaxy Note 8 or iPhone X, and in my experience with a Pixel XL, the device remained secure while making the screen visible as I drove. 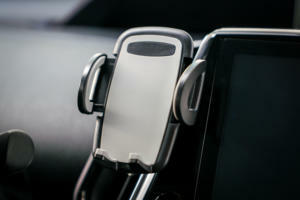 The Square Jellyfish Jelly-Grip Car Vent Mount is a mouthful, but it’s an excellent smartphone vent mount for your car. This phone holder uses an adjustable, solid metal hook that extends to slide through a vent (from 3/8” to 1” deep) and over its horizontal louvers. Square Jellyfish says that the mount can be used with vertical louvers, too, though we didn’t test that. If you have round louvers, it won’t work. The spring-loaded side grips grab phones up to six inches wide tightly—almost too tightly. Actually mounting the phone required placing it face down on a seat and grabbing it with the grips, then placing the whole contraption within the vent. You can also slide the phone out to remove it, but be careful of any side-mounted buttons. Curious about the other options? 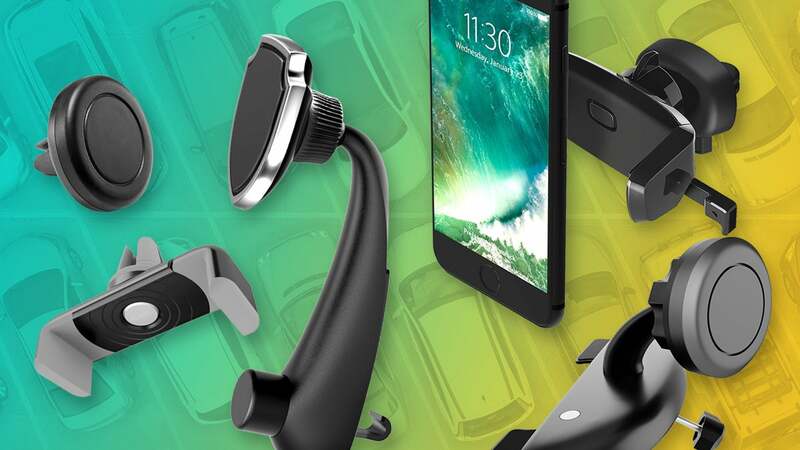 Below is a list of all the smartphone car mounts we’ve reviewed. Just click on the product name to read our hands-on observations. We’ve got more lined up for evaluation, so be sure to come back to see what else we’ve tested. iOttie’s Easy One Touch 4 Air Vent Mount is a solid pick, both in price and functionality. 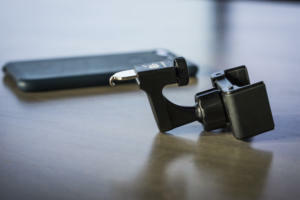 This mount has two parts, but it’s very easy to assemble: Just snap the vent clamp into the back of the phone mount, and attach it to your air vent using the spring-loaded clamp. 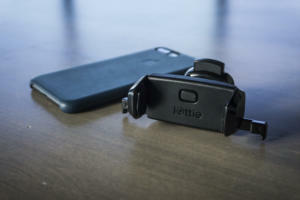 The mount keeps your phone in place thanks to two arms that hug it tightly, using a “lock and release” system. This iOttie mount held up well during my testing. The hinge continued to keep my iPhone held upright without sagging, and the mount stayed firmly clasped to the air vent without falling off due to my phone’s weight. Plus, it rotates 360-degrees to help you find the perfect viewing angle, be it in landscape or portrait orientation. The tradeoff? An absolutely secured phone that isn’t going anywhere. And since the grips swivel on a ball mount, you can still position your phone for easy viewing. As a final bonus, the manufacturer offers a lifetime warranty: Send Square Jellyfish a picture of the problem, and the company will ship a replacement, free of charge. At an MSRP of $25, it’s not one of the cheapest vent mounts on the market. But the durability and careful design are worth a few extra bucks. When it comes to phone mounts, youre unlikely to find a more simple, unobtrusive, and inexpensive option than this $7.99 kit. Slits on the magnetic mount’s short, rubberized stem allow it to slip onto your car’s air vent. 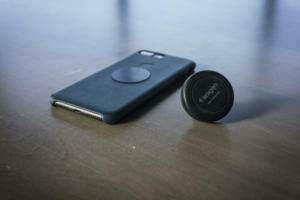 Attach one of the two included magnets to your phone, either by exposing the adhesive backing, or by slipping the thin magnet into your phone’s case. The downsides are that it blocks a vent and/or absorbs any hot or cold air your vent is emitting. Still, it’s an exceedingly simple solution for making your phone accessible while you drive. One potential issue with this Koomus model is its size. It's quite large, so depending on the placement of your CD player, it'll block access to controls. The arm that holds the phone in place also uses a simple friction ball joint with no ability to increase tension down the road once it’s worn in. While we had no issues with it new, we can foresee it drooping eventually. As its name implies, TechMatte’s Magnetic Universal Smartphone features a magnetic mount to hold your phones in place. 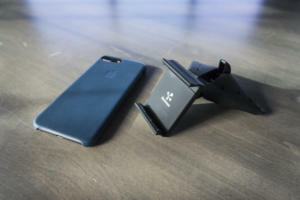 You attach one of the included metal plates to your phone, either by using the adhesive or by slipping it between the phone and its case, and then stick the phone to the mount in any orientation you desire. The magnet is decently strong—with the metal plate slipped between a Nexus 6P and its rugged case, the phone mostly stayed in place. The mount itself connects to its base via a ball joint with a collar that lets you torque it down for more tension. The CD mount is very slim but the system to add friction is unusual. It uses a simple thumb screw to add tension that holds it in place. The screw is slower than other systems, but it does let you add as much or little tension to the CD mount when in the CD slot. Oddly, on the car we tried it on, even with the screw tightened down, there was still a little more play than we expected. Overall, this TechMatte model does the job, but between its magnetic mount system (a style which I’m not totally sold on) and its slow-to-remove screw system, I’d go with a grip-style CD-slot mount—like this Koomus unit I also tested. This magnetic mount is interesting in that your phone sits at the end of a 3.5-inch arm, a good distance from the air vent to which its attached. That puts your phone out of the way of hot air in the winter. Since the arm can rotate 360 degrees and the mount's head pivots, you can adjust your phone's angle and orientation in a variety of ways. It's also pretty easy to install: Just attach the hooked end to your vent and tighten in place. Here are the drawbacks, though: This mount is not unobtrusive. It will most likely block something in its path—in my case, that was the stereo. While it can be pushed out of the way, this drawback is something to be aware of. Also, the weight of this relatively bulky mount turned my round vent downward, thereby rendering it useless. However, at $7 it's inexpensive enough to try out. In theory this magnetic mount seems great. It builds on the simplest of air-vent mounts, like the Spigen A200, by using a slightly longer stem, and featuring a rotating head so you can swivel your phone's orientation. At $9.99, which also includes three magnetic plates for your device, it remains incredibly cheap. Unfortunately, in practice, this mount is less than ideal. I had trouble getting the bite-lock attached firmly to my vent. When it was attached, the weight of the extended arm and phone caused the vent to turn down. Worst of all, it's far too easy for the tightening screw to come undone and the fiddly bits, like an internal spring, to fall apart, requiring careful reconstruction.